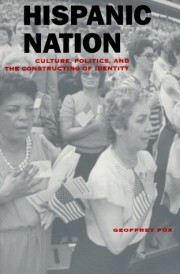 Hispanic Nation: Culture, Politics and the Constructing of Identity. Birch Lane Press, 1996; University of Arizona Press (paperback), 1997. Reviews: Washington Post, Booklist, The Latino Review of Books, and others. Featured in the 6-part radio series “Hispanic Nation: Made in the U.S.A.” broadcast nationwide during Hispanic Heritage Month (September-October) 1998.